What role did social networks such as Facebook and Twitter play in discussions about Edward Snowden, the National Security Agency’s Prism initiative and government surveillance? Pew Research Center’s Internet & American Life Project sought to find out by conducting a survey of 1,801 adults. We set out to study this by conducting a survey of 1,801 adults. It focused on one important public issue: Edward Snowden’s 2013 revelations of widespread government surveillance of Americans’ phone and email records. We selected this issue because other surveys by the Pew Research Center at the time we were fielding this poll showed that Americans were divided over whether the NSA contractor’s leaks about surveillance were justified and whether the surveillance policy itself was a good or bad idea. For instance, Pew Research found in one survey that 44 percent say the release of classified information harms the public interest while 49 percent said it serves the public interest. Respondents were less willing to discuss the Prism story on social media than they were in person, with 86 percent willing to discuss the issue in person, while just 42 percent said they would post about it on Facebook or Twitter. Of the 14 percent of respondents who were unwilling to discuss the issue in-person, only 0.3 percent said they would do so on social media. Respondents were more willing to share their views on the topic if they felt that their audience agreed with them. In the workplace, respondents were about three times more likely to discuss the Prism story if they believed their coworkers agreed with their opinions. The same trend applied on Facebook, as users of the social network were more willing to share their views if they believed their friends agreed with them, and they were twice as likely to join discussions about the issue on Facebook. Facebook and Twitter users were less likely to share their opinions face-to-face, with the average Facebook user one-half as likely as respondents in general to share their opinions with friends at a restaurant. That percentage rose slightly if they believed their friends agreed with their views, to nearly three-quarters. 58 percent of respondents received information on the subject from television or radio, followed by non-social-media online sources (34 percent), friends and family (31 percent), print newspapers (19 percent), Facebook (15 percent) and Twitter (3 percent). It has been well documented since before the Internet that a “spiral of silence” descends when people think their opinions are in the minority when compared to those around them — they don’t want to speak out if they think they hold unpopular views. This kind of self-censoring can mean that important information is never shared. Some had hoped that social media might provide new outlets that encourage more discussion and the exchange of a wider range of opinions. But we see the opposite — a spiral of silence exists online, too. If people did not think that their friends and followers in social media agreed with them, they were less likely to say they would state their views online. In addition, if they felt that they were in the minority opinion amongst those who follow them through social media, they were also less willing to join a discussion in in-person situations, such as gatherings of friends or co-workers. 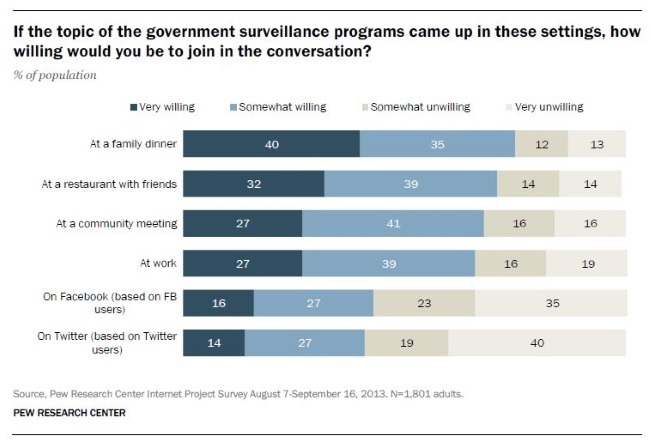 This raises the possibility that the spiral of silence spills over from online contexts to in-person contexts. The traditional argument is that the spiral of silence results from a fear of being ostracized or criticized by others. One possible explanation is that social media users are more aware of the diversity of opinions around them — especially on an issue where there is divided opinion. Because they use social media, they may know more about the depth of disagreement over the issue in their wide circle of contacts. This might make them hesitant to speak up either online or offline for fear of starting an argument, or offending or even losing a friend. Readers: What did you think of the findings by the Pew Research Center Internet & American Life Project? 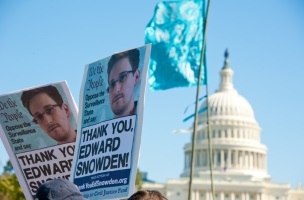 “Thank you, Edward Snowden” image courtesy of Shutterstock.